Especially for the wild mushroom fine art giclee prints taken of fungi living on the forest floor such as that of the great California coastal redwood forests. The mushroom photographs taken there almost always show aspects of the life cycle of the redwood forest as well as their own. In those pictures there seems to always creep in some of the characteristic organic litter of the redwood forest or the mushrooms themselves in the pictures are growing from a log or fallen redwood branch. 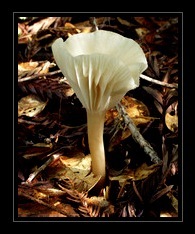 A good example of this variety of these sorts of redwood forest wild mushroom photographs is C Ribet The Sage shown at the on-line Gallery California fine art gallery of fine art giclee mushroom prints. In that beautiful mushroom giclee fine art print the redwood log is really the dominant feature, and there is a glimpse of the decaying organic litter beyond the plane of the photograph. 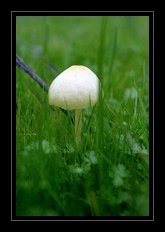 That was a picture (taken as a fine art giclee mushroom photograph) which yielded a superb mushroom giclee fine art print.